Are you playing the game – or is the game playing you? A highly addictive thriller about power, manipulation and revenge. Enter Erebos at your own risk. Exciting, suspenseful and totally unputdownable. I must honestly say, when Lizzy suggested Erebos as her readalong title, I wasn’t thrilled. I couldn’t tell you why. Certainly not because it’s a YA novel. Maybe because I wasn’t sure whether it was some sort of fantasy or a realistic thriller? And because I was worried about the writing. Some recent German thrillers that have made it into translation were anything but well written. 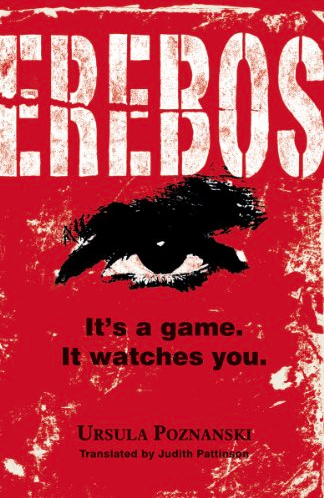 Imagine my surprise when I detected that Erebos wasn’t only well-written but so gripping and believable, I couldn’t put it down. It might be the thriller of the year for me. Unfortunately for this review, part of the appeal is that we don’t really know what’s going on. Is it realistic? Is it fantasy? Science-fiction? I don’t want to say too much. Only that I think it would appeal to anyone, whether you like more fantastic stories, or only read realistic novels. So what’s it about? At a school in London, students exchange a computer game. Those who play it are not allowed to talk about it. Those who don’t, either want to be part of what feels almost like a secret society, or they openly hate the game. Nick is at first one of those who don’t play the game. He watches his friends and is worried. What happens to them? Why are they sucked into this game like this? Finally someone passes the game on to him and he tries it out. Initially, he’s skeptical but that passes quickly and he, like all the others, is sucked into the world of Erebos. Being addicted to a game might be bad enough, but this one seems to have an agenda of its own. It seems to know the players and their secrets and uses this against them. Part of the game are assignments in real life, and soon the virtual danger become very real. I deliberately kept this summary very short because, as I wrote earlier, part of the appeal is discovering what’s going on. Nick is a great protagonist and we root for him. He’s likable but flawed and undergoes important changes. I really loved how Ursula Poznanski described the world of the game and the addictive part was shown in a very believable way. Once the assignments in the real word start, an entertaining read turns into an eerie thriller. I couldn’t stop reading, wanted to find out what was behind it all. So often thrillers have disappointing endings. Here again, Erebos is an exception. It’s pitch perfect from beginning to end. A must read for those who love YA novels and for fans of original, futuristic thrillers. I’m not surprised that Erebos has won the Deutscher Jugendbuchpreis, the German prize for Children’s Literature. It’s captivating and topical. I finished this book before the attacks in Paris but meanwhile, I’ve heard that the terrorists also communicate via computer online games. A communication that’s particularly hard to decipher. All of a sudden, Erebos his even more topical. It certainly has a lot to say about addiction, manipulation, and retribution. Don’t miss it. It’s nice to be back viewing my favourite book blogs again. This looks like a great book for young adults but as you say, it has quite an appeal to adults too. Very topical theme by the sound of it. Welcome back, Tom. I just saw before you’re blogging again. That’s great. Yes, it’s topical and well done. I hope they will translate more of her. Her novels for adults too. The writing us tight. It’s wonderful, isn’t it, when you begin a book reluctantly and end up thinking it’s one of the best of the year. Absolutely. I really didn’t expect it. Not my genre, but I’m intrigued. I too heard the terrorists in Paris were using video games to communicate. The mastermind was only 27. Unfortunately, addiction to video games is a very real thing nowadays. I don’t play video games but I was thinking that many people, unknowingly might have played with them Creepy. Thanks for joining me, Caroline. Am glad you were wowed also. Am finding that factoid about Paris more than a little eerie … I had no idea tht my readalong choice would prove so zeitgeisty ….. It is eerie, isn’t it? I think computer games have a lot to answer for, especially in desensitising people to violence. I hope the research backs up my opinion one day. 😛 The plot of this book sounds like something that could happen. A lot of people are naive/silly enough to get sucked into something like that. Yes, it could happen. There’s an element that stretches the possible but – something similar is already possible. I don’t know about the violence but I’m pretty sure you’re right. I watched the mini-series Generation Kill a while ago and it’s based on true accounts. That and some of the other newer war movies underline how some troops see the shooting of people just like a video game. I’m not keen on futuristic thrillers normally, so I was really astonished that I liked it so much. Wonderful review, Caroline. I couldn’t join the readalong and now I am kicking myself on why I didn’t do that. This looks like a gripping thriller and I am glad that the ending is pitch perfect – because many times thrillers which are gripping have disappointing endings like you have said. Adding Poznanski’s book to my ‘TBR’ list. The plot of this book sounds so interesting. Addiction as well as other anti social behaviors related video games as well as other aspects of our digitally driven world are real issues. I happen to find these issues very interesting. It is great that this is also a well written, gripping book. I find them very interesting too and she captured also the appeal of these games quite well. That is the kind of book that I wouldn’t usually pick up. YA fiction and in addition the subject matter, no maybe this is not for me. But I am impressed by the very positive reviews here, so I am getting interested and maybe give it a try in the near future. Always nice to get such reading recommendations from fellow book bloggers. I wouldn’t have picked it but the writing was assured and it was really gripping. Maybe, if you’re in the mood for something lighter you might like one of her thrillers for adults. I agree and it was such a pleasant surprise. I’m intrigued by this just because of the psychological aspect. I wonder how the game manipulates the players and what they have to do and to what end. The rest feels too anchored in real life for comfort. Somebody should think of games with positive messages. Wouldn’t that be great! That would be great but I haven’t seen that so far. I found it was well done and believable. Not possible yet – but you could imagine something like this.